While the population of wild horses and burros in the American West has exceeded 82,000 equines, adoptions are down. To encourage more people to adopt, the Bureau of Land Management is offering people a $1,000 incentive to adopt, hoping that this will address overpopulation and keep horses from starving. It’s a nice idea. But . . . In reality the implications are horrific. 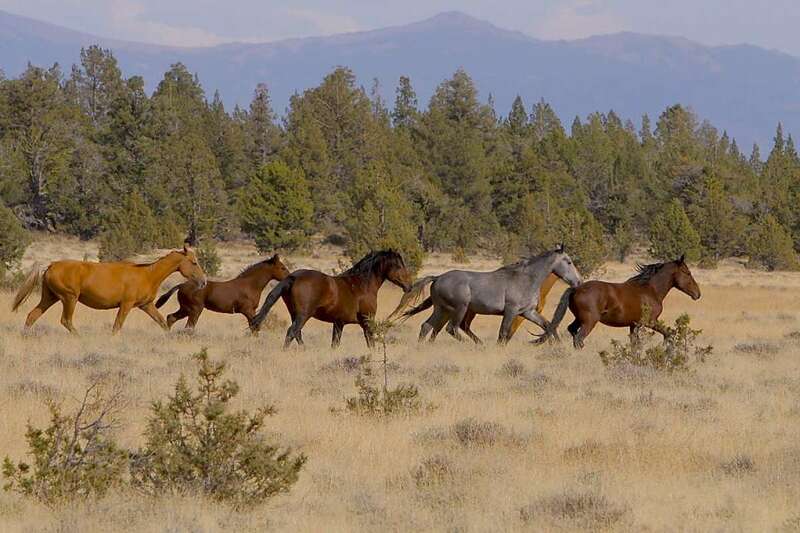 An estimated 4,000 wild horses live on the Modoc Plateau. U.S. Forest Service biologists say the habitat can support 400. Under the agency’s adoption incentive program, adopters are eligible to receive $500 within 60 days of adopting an untrained wild horse and burro, and another $500 within 60 days of titling the animal. People interested in the program can adopt and maintain four wild horses or burros each year. The economics from the BLM’s perspective are clear: it costs the agency about $2,000 per year to care for the horses they capture and coral. By giving them away with a $1K bonus, the agency will save money. The number of people who should adopt an untrained wild horse is limited. That’s probably one of the reasons why last year the BLM captured 11,472 horses and burros from the wild, but only 4,609 were adopted. Training a wild horse is the stuff of Walter Farley novels, but is simply not practical for the average armchair cowboy. People will get hurt and frustrated; horses will be discarded as dangerous and will likely go to auction and more than likely to slaughter. The economics make it very attractive for people to adopt the horses and then sell them at auction. If you can get the BLM to give you $4K/year for four horses and you sell each of them at auction for $1.50/pound. You have to keep them for 2 months, but that’s not a huge deal. 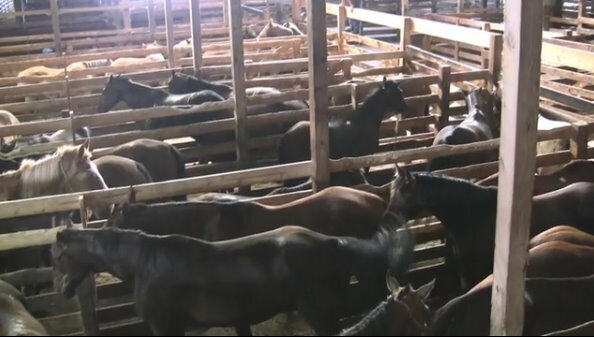 Horses in auction pens frequented by kill buyers. The sad part of this equation is that if these horses are shipped to slaughter, they will go to Mexican slaughter houses, known for their inhumane practices. As of December 6, 2018, 65,915 horse were shipped to slaughter in Mexico. In fact, there are reports that the BLM has complicit with schemes to sell wild horses to slaughter for years. The BLM, which is charged with protecting wild horses actually sold more than 1,700 of them to a Colorado rancher who illegally sent them to slaughterhouses in Mexico. Over the course of four years, from 2008-2012, the rancher, Tom Davis, purchased loads of horses for $10 each and resold them for meat. The BLM released a statement saying it had taken steps to improve its oversight of wild horses, including limiting purchases to just four per buyer. Wouldn’t it be better to come up with more humane way to deal with these herds? Or simply open up more of the land for their welfare and put more restrictions on ranchers grazing cattle on public lands? What do you think can be done to preserve the wild horses? I love this and your points; I couldn’t agree more and was actually planning to write something a bit similar myself in the coming week. I would love to link to your once I do. Please do link to this post. I look forward to reading yours. Leave them ALONE. The BLM has been in bed with ranchers for years. The range lands that are OURS are being raped by ranchers, and they don’t like mustangs taking even one bite of “”Their””” grass. Let’s never mind that a horse can prosper on range that cattle starve on. One of the women in my barn adopted a 2 year old BLM Mustang filly (with a filly at foot) several years ago. She couldn’t even get NEAR the filly for 6 months. Mustangs are wild animals. You never hear of someone taking a full grown moose out of the wild and attempting to teach it to do something. No, because a moose is a wild animal. Well, so are mustangs. but because they look just like the pony in the barn, people assume that they can be trained in a matter of minutes. I’ve seen the BLM concentration camps. They’re barren. If you saw the way they are treated…and I will say that I didn’t seen outright cruelty, but mass handling of horses is by it’s very nature, rough. The pen, with horse inside, is then turned horizontally so that the horse is on it’s side. The four hooves are sticking out. A man with a rotary sander…just like the ones used to smooth rough wood…is placed against the sole of the hoof and the entire bottom part of the hoof is sanded. No measurements (of course, being mustangs, they have hooves like rocks), no attempting to correct something, just sand it off, frog, bars, hoof walll buzzzzzzzzzzzzz just like that. Four hooves takes about a minute, total. Meanwhile, if the horse is a colt, it’s gelded, the horse is inoculated, and once the pen is returned to vertical position, if the horse needs branding, it’s done then. Then it’s released. Total handling time…five minutes? No gentling, no softness, because they have a LOT of horses to process. Of course they’re selling the horses off for meat. The law against it was …killed, let’s say, or circumvented,after the larding of several political hands. Oh, dear. Stop me. I can’t stand the abuse of innocent horses. Sorry for the ranting but..this is a hot button for me. Sorry. OMG. I had no idea it was that terrible. I just know that their new plan will not benefit the horses. Taking on feral horses to train is not for the unskilled or the amateur. Paying someone to take a feral horse almost guarantees the horse will go to Mexico. It’s hard enough retraining a racehorse, and they have a lot of handling and time under saddle.